Say goodbye to ugly water spots on your kitchen faucets and stains in your toilet bowls! You can clear up these gritty hard water deposits in four easy steps. Are there always white spots on your bathroom fixtures? Does a cloudy film coat the carafe of your coffeemaker? If so, yours probably belongs to the 85 percent of households with hard water. The discoloration you see is the buildup of minerals left behind by evaporated water. 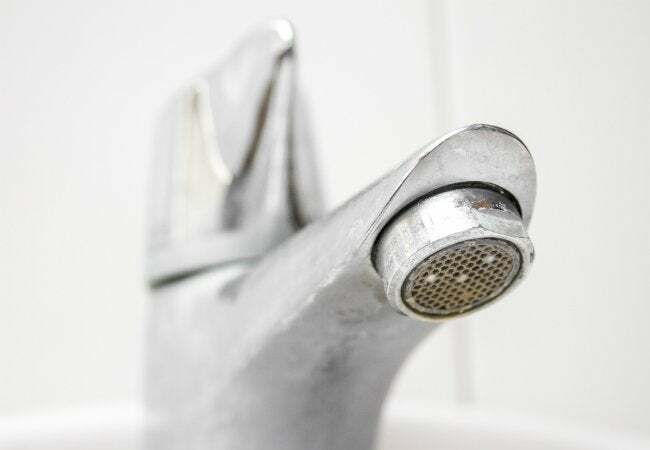 Unchecked, hard water deposits can go a long way toward gunking up some of the most commonly used components in your home. Fortunately, they are easy enough to remedy—indeed, in only four steps. Follow this tutorial for how to remove hard water stains on any sink, tub, or toilet. Pull on a pair of gloves and reach for an acidic household cleaner, such as metal-and-rust remover. Or, if you prefer, make your own formula by combining equal parts vinegar and water. Add the mixture to a spray bottle, then get to work. If it’s a store-bought cleaner, be sure to consult the instructions printed on the label. If you’ve gone the homemade route, simply spritz the vinegar over the entire water-stained surface. Let it sit for a brief period of time before you continue. 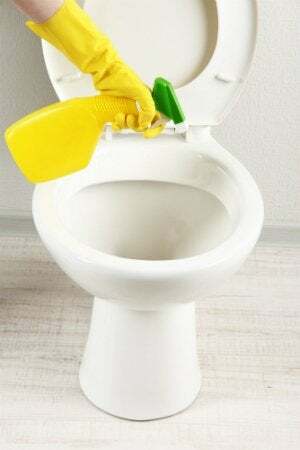 Scrub, scrub, scrub the area with an old toothbrush (or a toilet bowl brush, if that’s what you’re cleaning). The brush bristles provide just enough abrasive power to wear away the acid-loosened mineral deposits. Continue spraying on additional cleanser, following up by scrubbing, until even the most stubborn hard water stains are gone. If it’s tough going, try this: Pour the vinegar-and-water solution into a small bowl, then add enough baking soda to create a paste. Dip your brush in the paste, then try scrubbing again. This time, the stain ought to give way. The more often you clean, the less stubborn the stains become. Having removed the last of the mineral deposits, rinse the area with a dripping wet sponge. Finish by wiping the area dry with a soft cloth. Be sure to dry the area completely, or else the spots may reappear! • Wipe away water as soon as you are done using a faucet. Hard water cannot leave a staining deposit if you get rid of it quickly. Keep a cloth near each of the faucets in your house and wipe up excess water. • At least once per day, wipe down or lightly mist vulnerable areas with a natural cleaner. Doing so may not completely prevent hard water stains, but it’ll make the job easier when you clean in earnest later on.